La casa es una construcción de piedra, típica de los pueblos de la zona, con un acre de jardines. Los extensos Jardines ofrecen una multitud de diferentes ambientes. Desde la formalidad de los patios y piscina con su "chill-out", la refrescante sombra bajo la viña, las aromas del jardín de hierbas, bosque, rocallas y un estanque "silvestre", todos con sus rincones escondidos para disfrutar. Situada en una atractiva aldea a las afueras de Valença, en la ladera del Monte do Faro con sus espectaculares vistas, es el centro idóneo para descubrir las hermosas tierras del "Baixo Minho"ó simplemente relajarse. Hillside is a charming stone-built private house with one acre of gardens. Carefully renovated by its`owners, respecting the traditional structure but with a wholly contemporary style, the orriginal walls are now incorporated within the extended house contrasting with the softer tones of wall-papers and paint to create a peaceful harmony between past and present. Relaxing Gardens offer a multitude of different atmospheres and a host of hidden nooks to enjoy. Not only the formal pool and patio area or cool shade of the Hillside Vine and perfumes of the kitchen garden but woodland,rock and heath with even a wildlife pond as an additional surprise. 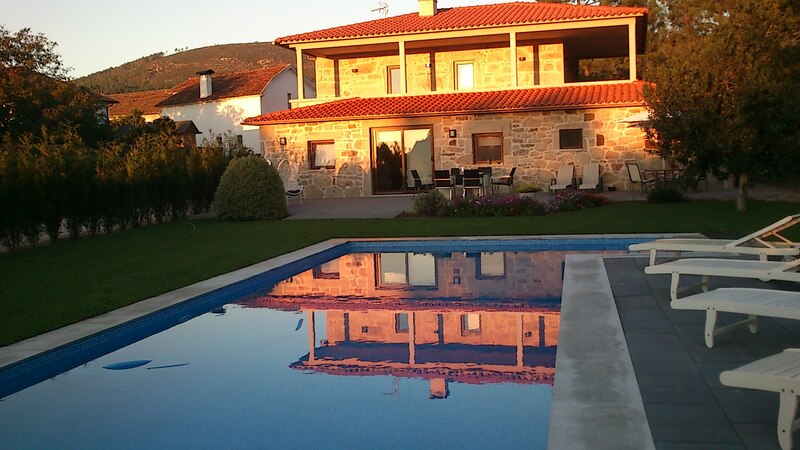 Situated in an attractive village on the slopes above Valença, the area offers spectacular views over the Minho Valley and is the ideal centre to explore the beautiful border lands of the "Lower Minho" or simply relax.